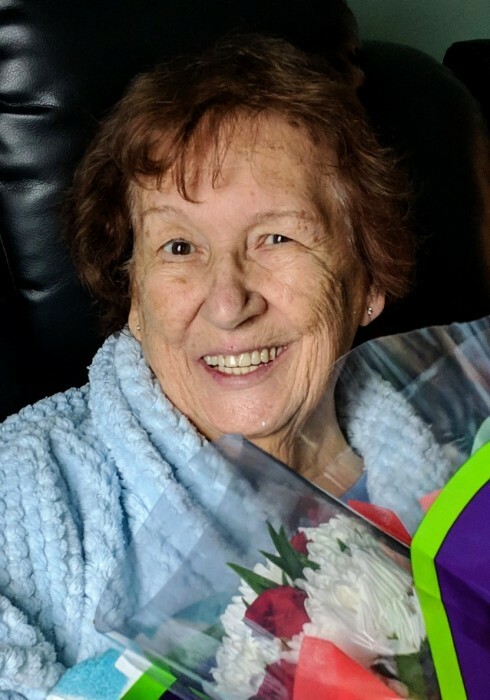 Obituary for Rosaria (Falco) Beamsderfer | Shore Point Funeral Home and Cremation Services, Inc.
Rosaria Beamsderfer, 85, of Union Beach, New Jersey, passed away peacefully surrounded by her loving family on Friday, April 5, 2019 at her daughter's home in Dana Point, California. She was born Rosaria Falco on November 30,1933 in Newark, New Jersey, where she spent the beginning of her childhood. At 11 years old, Rosaria moved to Union Beach, New Jersey, where she remained and later in life, raised her family. Before retirement, she worked for Anchor Glass as a Quality Control Inspector in Cliffwood, New Jersey for 25 years. After her retirement, Rosaria continued to stay busy, selling Avon products and also working in various supermarkets preparing food demonstrations. She was predeceased by her parents, Francesco and Marianna (Terranova) Falco, her beloved husband, Russell "Whitey" Beamsderfer Jr., and her brothers, Andrew, Vito and Frank Falco. Rosaria is survived by her loving children, Jacqueline Nixon and her husband, Richard of Union Beach, Sharon Diamond and her husband, John, Alexander Diamond and his wife, Jeannie, of Whiting, Frank Diamond of San Diego, CA, Rose Rubino and her husband, Steve, of San Juan Capistrano, CA, John Diamond and his wife, Jerry, of Raleigh, NC, and Holly Watson of Dana Point, CA and her dear siblings, Peter Falco, Stephanie Moore, Salvatore Falco, and Marianna Falco. She is also survived by her cherished grandchildren, Regina Diamond Rodriguez, Jason Nixon, Seanessy Keefe, Eric Diamond, Ryan Keefe, Nicole Rubino, Laurene Keefe, Ashley Nixon, Alex Nixon, Nick Rubino, Alexander Diamond, Brian Pluma, Melissa Diamond, Derek Pluma, John Diamond III and Dylan Watson, along with 11 adored great grandchildren. Rosaria will be greatly missed, but never forgotten. Family and friends are invited to visit on Friday, April 12, 2019 from 4:00 to 8:00 PM and Saturday, April 13, 2019 from 10:00 to 10:45 AM at the Shore Point Funeral Home and Cremation Services, Inc., 3269 State Highway/Route 35 North, Hazlet, New Jersey 07730. A prayer service will be offered at the funeral home on Saturday morning, April 13, 2019 at 10:30 AM. Entombment will follow at Holmdel Cemetery Mausoleum, 900 Holmdel Road, Holmdel, New Jersey 07733. For information, directions, or to send condolences to the family, please visit, www.shorepointfh.com.